"“ I have worked with Joann and Mike Bell, Inc. on many custom pieces for my clients and it has been a wonderful experience every time. I am 100% confident bringing my clients to the showroom because I know they will end up with a custom piece that is impeccably constructed and will last for generations to come.”"
"The bed is beautiful. When we came to redo the master bedroom for my client in Palm Beach, it was the only piece that we kept from her original master bedroom set. It was so strong and we all agreed that it would work beautifully in the new space as it did in the old." "The Mike Bell pieces look amazing! " "There is always something new and interesting in the Mike Bell showroom. Joann has impeccable taste and every unique piece tells a story. I loved using these black and gold table lamps in my design for the Dream Home living room – they made a huge impact in the room! " "The Leik table is incredible. Thank you so much. We installed yesterday!" "I recently ordered a custom Somerset II bench for my client in Lake Forest from Mike Bell and we both couldn't have been happier with the piece. They did a beautiful job on matching the finish to other antiques in the room, as well as upholstering the herringbone fabric to appear as if it was seamless. They really paid attention to all the details and it's a piece that really stands out in the space. Thank you Joy and Joann for going above and beyond on making sure that my client and I were happy." 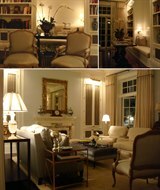 "Returned from Aspen and the furnishings look ABSOLUTELY GORGEOUS!!!!! Couldn't be happier! " "We want to thank you for creating such a beautiful dining set for our clients! We/ They are so happy and it looks terrific! " "So happy....everything is absolutely gorgeous! I walked upstairs and our client was sitting in the chairs with his feet up & smiling. :) Thank you again!" "Just beautiful, Joann. We had dinner on it tonight. Very comfortable chairs and the table is perfect!!! Side board fits perfectly!" "After developing a design concept for our client’s dining room and knowing their expectations it was obvious Mike Bell, Inc. was the appropriate workroom for their project. The custom capabilities coupled with the quality of the product is unparalleled. The convenience of working with a local workroom was a plus as from start to finish there were periodic meetings to address design details and tests to insure the seating had the correct posture and comfort level to suit our client." "Thank you for your spectacular service and extraordinary pieces!" "A truly exceptional showroom with exemplary service. Joann has an eye for detail and each piece they have created for us has been customized to our precise needs and finished to perfection, all within the time quoted. The showroom has a vast inventory of styles - perfect for a variety of clients and aesthetics. The end result is always a happy client - which makes us very happy, too!" "Beautiful!!! I love it!! " "Thank you so much for the beautiful piece!!" "If I could, I would use Mike Bell in every project. " "When I get back to Palm Beach, I can send you some photos... but it probably won’t do justice to how beautiful the Mike Bell furniture is. We are so happy with everything you’ve made for us." 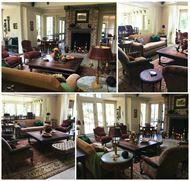 "When asked if the clients enjoyed their Mike Bell, Inc. & Westwater Patterson Hunt Chair, Lawrence Boeder replied, 'Yes! Love it!"" "Mike Bell is known for expensive high quality items and the ability to create what my clients are looking for. " -- Jerry Nelson, principal, Nelson Assoc. Architects, P.C. "Mike Bell, Inc. is the best of the best with a variety of product... a one stop shop, as it now represents an eclectic sense of style with antiques and reproductions for the higher end client. If they don’t have what you want, they will make it." -- Denise Antonucci, Principal, A.S.I. Interiors, Inc.
"Oh my Word !!! Am I happy, Wow Joann, you are so fabulous. I am going to be in Chicago this coming week and was going to stop by to see you. But I'll tell you now, Exquisite !!!! You are so wonderful and you have great people behind you. You make it happen !!!! Yes I am so very happy!!!" 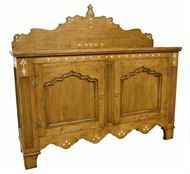 "Mike Bell is top of the line, quality furniture. Solid, staid... “in a good way”... which is fleeting in today’s industry.” "